When it comes to mosquito control there are a wide variety of chemicals to use depending on control application. Mosquito control can be implemented for an outbreak or just to eliminate the amount of mosquitoes during specific seasons. There are three common chemicals used in mosquito control. All three chemicals are used for controlling mosquitoes in different applications. Larvicides are chemicals designed to be applied directly to water to control Mosquito larvae. Adulticides are chemicals that state and county departments use more frequently. These chemicals are used in fogging and spraying to control adult mosquitoes. Synergists are not toxic to the mosquitoes, but this chemical makes the adulticides more effective when fogging or spraying. Methoprene is the acting ingredient found in adulticides. It prevents insect growth and behaves like a hormone in insects. By preventing insect growth, it interferes with future growth and development. Methoprene is available in over 500 pesticides and is commonly added to insecticide products because it affects the insects the survive exposure to other related pesticides. Methoprene should be stored in a climate controlled environment at 68°F. It can be stored for up to 12 months and when applying chemical solutions it should be prepared and used on the same day. Solutions can be stored for up to one month. 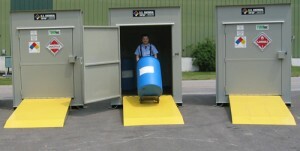 Store mosquito control chemicals inside an enclosed chemical storage container with proper EPA compliant sump control. Proper ventilation and climate controls are necessary with specific types of mosquito chemicals. Store away from heat, flame or static electricity. Store in a cool, dry atmosphere. Do not reuse or refill containers being used to store chemicals. For disposal of chemical storage containers, contact your local hazmat waste department. Mosquito control chemicals are harmful if absorbed through the skin, eyes, or clothing. If methoprene or any other mosquito control chemical comes in contact with skin, clothing, or in the eyes follow these first aid steps below. Skin or Clothing: Rinse skin immediately with lukewarm water for 15-20 minutes. Take off contaminated clothing immediately before touching skin. Contact a poison control center for immediate advice. Eyes: If chemicals are splashed into eyes, immediately rinse eyes with water for 15-20 minutes. Remove glasses or contact lenses before doing so. Call a poison control specialist for more information and treatment. NPIC. OSU. Methoprene General Fact Sheet.